Today I'm teaming up with +Megan Sheakoski from +Coffee Cups and Crayons and +Jamie Reimer from +hands on : as we grow to bring you a fun Google + Hangout on Valentine Alphabet Activities for Preschool. We'll be chatting live on G+ at 2 pm CST on Monday, February 4th. You can also catch it Live right here at Ready-Set-Read.com. If you can't join us live, you can watch the video anytime. Jamie and Megan have very fun Valentine activities for preschool that I know you are going to love! Megan is sharing Broken Heart Letter Puzzles. Jamie used scrabble tiles for a super fun letter learning and matching game. 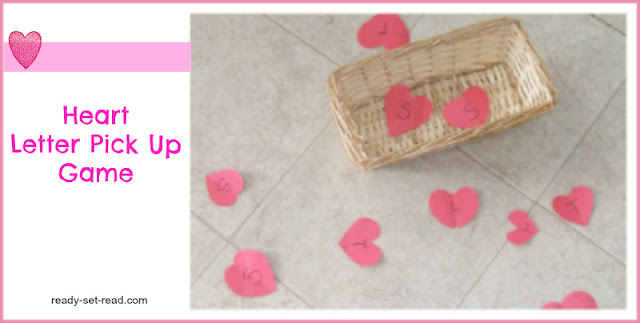 I'm sharing my Heart Letter Pick Up Game and Song. The bloggers behind Inspired by Family Mag, The Pleasantest Thing, and +Mama Smiles - Joyful Parenting will share activities, crafts and cooking for kids with a Valentine's Day Theme. Kid bloggers from +hands on : as we grow +Inspiration Laboratories and +Red Ted Art will share activities for kids based on Valentine's Day conversation hearts. I hope you find these Valentine's Day for Kids hangouts fun and helpful. These are usually quick 10-15 minute hangouts. My boys love to watch with me! So grab a cup of coffee, put a kid on your lap if you'd like, and check out some fun for Valentine's Day. Love your post. Can you add social media buttons to your post so it's easier for us to share it? For Twitter, Pinterest would be wonderful. I think there is a widget on Blogger for that.